Okay, you guys... I'm officially a fan of Doctor Who. The newish version, that is, that started in like 2005 or something? Yeah. Anyways, my friends have been posting things about the TARDIS and Doctor and Daleks and stuff for ages. After a bit of probing to find out which series to begin with, I began with Chris Eccleston as the Doctor and his companion Rose Tyler. I'm kind of hooked. Sure, the premise and episodes are cheesy and hokey at times, but I really enjoy the stories. Each episode or arc is like a mini sci-fi movie. I've even gotten choked up at times, seriously creeped out (like the weeping angels, library shadows), and I laugh a lot. The special effects do get a lot better even a couple of seasons in. I knew from internet posts that the Doctor regenerates from time to time, replacing him with a new actor. What I did not realize is that the companions also change. So it was definitely an adjustment for me to have to deal with new characters all the time. I'm in the middle of David Tennant's stint right now, and it actually took me a while to like him. Call me a weirdo, but I really liked Chris Eccleston. 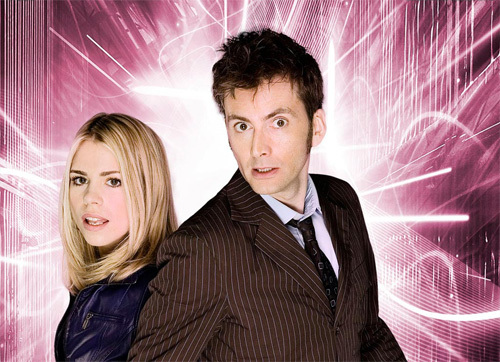 And I'm a big-time Rose Tyler fan for the unrequited love angle, though Donna Noble is possibly by favorite so far. In good nerd fashion, I love to catch the hidden references to previous episodes as the series progresses. I don't watch it every day, or even every week, but when I want to veg out and turn on Netflix, it's my destination every time. Thanks, fellow nerds, for converting me! Except that most of the people I see every day don't watch it, so they don't get it when I crack up because someone says something like a Dalek or I say something like, "Allons-y!" Dork. Guess I'm a Whovian now! Fellow nerd here. I finally gave in to the hype about a year ago. I watched from where you started to the current season in about 3 months. Love it! It's so good sometimes... and cheesy otherwise.